According to Philip Kotler, the widely acknowledged "father" of modern marketing, and Fernando Trias de Bes the marketing techniques pioneered in the 1960s and '70s have worked too well. Fierce competition among products with little or nothing to distinguish one from another, along with modern product positioning and targeted marketing techniques, have led to increasing market segmentation. If the trend continues, individual market segments soon will be too small to be profitable. In Lateral Marketing, Kotler and Trias de Bes unveil a revolutionary new model to help readers expand beyond vertical segmentation and generate fresh marketing ideas and opportunities. Philip Kotler (Chicago, IL) is the S. C. Johnson & Son Distinguished Professor of International Marketing at Northwestern University's Kellogg School of Management. Fernando Trias de Bes (Barcelona, Spain) is the founder of Salvetti & Llombart whose clients include Pepsico, Sony, Hewlett-Packard, Nestlé, Credit Suisse, and other top corporations. PHILIP KOTLER is the S. C. Johnson Distinguished Professor of International Marketing at Northwestern University’s Kellogg School of Management. Considered the father of modern marketing, he is the author of twenty-five books, including Marketing Insights from A to Z, also available from Wiley. He has worked as a consultant to corporations such as IBM, Bank of America, General Electric, and AT&T. FERNANDO TRIAS de BES is founder and Partner of Salvetti & Llombart, a firm specializing in consulting and market research with an international scope and clients such as PepsiCo, Sony, Hewlett-Packard, McKinsey & Co., Nestlé, and Dannon. He is also a consultant on innovation in marketing. He is an Associate Professor of the Marketing Department at ESADE Business School in Barcelona. 1.The Evolution of Markets and the Dynamics of Competition. 1.1 In Consumer Packaged Goods, Distribution Concentration Has Increased Greatly. 1.2 The Number of Competitors Has Been Reduced, but the Number of Brands Has Strongly Increased. 1.3 Product Life Cycles Have Been Dramatically Shortened. 1.4 It Is Cheaper to Replace than to Repair. 1.5 Digital Technology Has Provoked a Revolution in Many Markets. 1.6 The Number of Trademarks and Patents Is Increasing. 1.7 The Number of Varieties of a Given Product Has Increased Radically. 1.9 Advertising Saturation Is Reaching Its Highest Levels, and the Fragmentation of Media Is Complicating the Launch of New Products. 1.10 The Capacity of Obtaining Space in the Mind of the Consumer Has Been Reduced. Conclusion: Markets Are Much More Competitive. 2.Strengths and Weaknesses of Traditional Marketing Thinking. 2.1 Needs Identification as the Starting Point. 2.2.2 Adoption of a Market Category and Subcategory by Marketers. 2.2.3 Adopting a Market as Something Fixed Leads to Segmentation. 2.3 Segmentation and Positioning as Competitive Strategies. 2.3.2 Positioning as a Strategy for Generating Competitive Advantages. 2.4 The Development of the Marketing Mix: The Only Thing That Is Seen. 3.Innovations Originated from Inside a Given Market: The Most Common Way of Creating Innovations. 3.1 Innovations Based on Modulation. 3.2 Innovations Based on Sizing. 3.5 Innovations Based on Complements Development. 3.6 Innovations Based on Effort Reduction. 4.Innovations Originated Outside of a Given Market: An Alternative Way to Create Innovation. 4.1 The Case of Cereal Bars. 4.2 The Case of Kinder Surprise. 4.3 The Case of 7-Eleven Japan. 4.4 The Case of Actimel, from Dannon. 4.5 The Case of Food Stores inside Gas Stations. 4.6 The Case of the Cyber Café Concept. 4.7 The Case of “Be the Godfather of a Kid”. 4.8 The Case of “Big Brother” TV Contest. 4.9 The Case of Huggies Pull-Ups. 4.10 The Case of Barbie. 4.11 The Case of Walkman. 5.The Need for Lateral Marketing to Complement Vertical Marketing. 5.1 Basis of Vertical versus Lateral Marketing. 5.2 How Lateral Marketing Works versus Vertical Marketing. 5.3 Effects That Lateral Marketing Provokes in the Markets versus Vertical Marketing. 5.5 Situations Where Each Type of Marketing Is More Appropriate. 5.6 Responsibility of Creating in the Markets. 6.Defining the Lateral Marketing Process. 6.1.1 Objectives of Lateral Marketing. 6.3 Similarities between Humor and Creative Thinking. 6.4 Importance of Understanding the Logic of Creativity. 6.5 The Three Steps of Lateral Marketing. 6.5.1 Choosing a Product or Service. 6.5.2 Step 1: Choosing a Focus in the Marketing Process. 6.5.3 Step 2: Generating a Marketing Gap. 6.5.4 Step 3: Making Connections. 6.6 Final Outputs of the Lateral Marketing Process. 6.7 Examples from Chapter 4 under the Lateral Marketing Framework. 7. Lateral Marketing at the Market Level. 7.1 Change of Dimension as the Most Practical Technique. 7.2 Dimensions to Be Changed: Concept and Examples. 7.2.1 Changing the Need: Trying to Cover Another Utility. 7.2.2 Changing the Target: A Person, Persons, or a Group. 7.2.3 Changing the Time: Choosing New Moments. 7.2.4 Changing the Place: Move Your Product into a New Setting. 7.2.5 Changing the Occasion: Link Your Product to an Event. 7.2.6 Changing the Activity: Place Products into Experiences. 7.3 Connecting the Product with the New Dimension. 7.3.1 Connections Made without Altering the Product. 7.3.2 Connections Made by Altering the Product. 7.4 A Complete Case: Proposing a New Business Concept. 7.5 Ancillary Techniques for Displacing the Market Level. 7.5.1 Combining the Dimension “Place”. 7.5.2 Reordering the Dimension “Time”. 7.5.3 Exaggerating the Dimension “Place”. 7.5.4 Inverting the Dimension “Need”. 7.5.5 Inverting the Dimension “Target”. 7.5.6 Eliminating the Dimension “Time”. 8. Lateral Marketing at the Product Level. 8.1 Philosophy behind Applying Lateral Marketing at the Product Level. 8.2 Dissection of the Product. 8.3 Selecting the Entry Doors. 8.3.1 Selecting Natural Anchors as Entry Points. 8.3.2 Selecting Other Elements as Entry Points. 8.4 Applying Lateral Displacements: Concept and Examples. 8.5 Connecting a Possible Market with the New Product. 8.5.1 Finding a Possible Setting. 8.5.2 Extracting the Positive Things. 8.5.3 Imagining the Purchase Process. 8.6 The Product May Need to Be Adjusted. 8.7 A Complete Case: The Double-Decker Car. 9. Lateral Marketing at the Marketing Mix Level. 9.1 Effects of Lateral Marketing at the Mix Level. 9.2 Lateral Marketing for Diversifying Our Marketing Mix: “Taking the Mix of Other Products”. 9.3 Lateral Marketing for Finding New Marketing Mix Formulas: The Rest of the Lateral Displacements. 9.4 The Product May Need to Be Adjusted. 9.5 A Complete Case: Steel Shops. 10.1 The Three Systems of an Innovative Company: The Gary Hamel Model. 10.2 Next Step: Managing the Whole Process. Appendix: Quick Reminder of the Lateral Marketing Framework. Kotler is widely considered one of the architects of modern marketing. He was the first recipient of the American Marketing Association's Distinguished Marketing Educator Award in 1985; and it is largely due to his presence that Business Week calls Kellogg the "Best Business School" for teaching and marketing. The awards and honors he has accrued in his forty-year career are staggering. Here he pairs with an international consultant and academic. 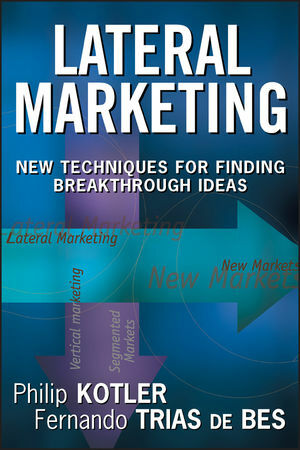 Kotler introduces a new paradigm for the creation of big marketing ideas: lateral marketing. Not intended to replace existing structures of segmentation, targeting and positioning, lateral marketing will instead expand the vision of marketing beyond the sequential and logic process in which it is based, with an infusion of creative thought. Today, only one in 30 new products succeeds, as opposed to one in 20 only ten years ago. Fierce competition and product homogeneity have caused companies to segment to smaller and smaller percentages of the population-eventually, these segments will be too small to be profitable. The academic world is hungry for fresh thought and effective methodology, and no one is more often consulted for this kind of wisdom than Philip Kotler.